GEORGE HANSON - KAYLOR MANAGEMENT INC. 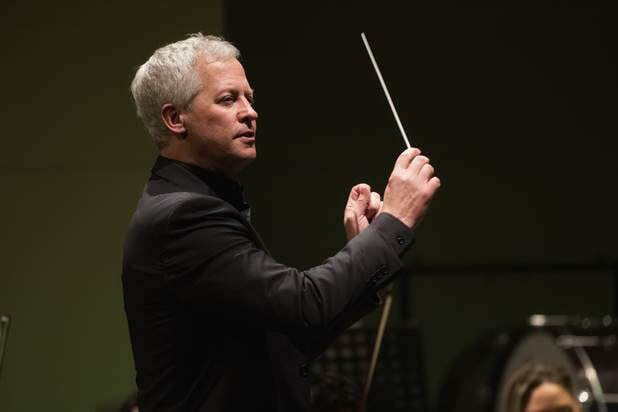 Since first drawing international attention with First Prize wins at the Budapest and Stokowski conducting competitions, George Hanson’s career has taken him to more than 20 countries, conducting over a hundred orchestras and operas on five continents. Director of the Tucson Desert Song Festival; Artistic Director of Oregon’s Sunriver Music Festival, and Artistic Advisor of Mexico’s Orquesta Filarmonica de Sonora, orchestral engagements include the New York Philharmonic, Chicago Symphony, Atlanta Symphony, Indianapolis Symphony, St. Paul Chamber Orchestra, Charlotte Symphony, the Radio orchestras of Hamburg and Berlin, Warsaw Philharmonic, Zürich’s Tonhalle orchestra, the orchestras of Osaka and Seoul, the national orchestras of Colombia, Bulgaria and South Africa. Operatic highlights include Berlin’s Komische Oper, Budapest National Opera, Minnesota Opera and Arizona Opera. Sold out concerts and exciting new programming have marked mark Hanson’s tenure as Artistic Director of the Sunriver Music Festival in Oregon, USA. In Germany, as General Music Director of the Wuppertal Opera and Orchestra for six seasons, Hanson oversaw more than 50 opera productions, garnered national recognition for the orchestra’s Mahler and Shostakovich concert cycles, and won the Echo Klassik award for best classical recording. Hanson served for seven years as assistant to Leonard Bernstein, assisted Kurt Masur for five seasons and assisted Giuseppe Patane at La Scala. Trained at Vienna’s Hochschule für Musik, Italy’s Accademia Chigiana, Tanglewood and the Curtis Institute in Philadelphia, Hanson studied under Seiji Ozawa and Franco Ferrara. Hanson recently added trumpeter Chris Botti and violinist Pinchas Zukerman to a long list of important artistic collaborators, including Joshua Bell, Itzhak Perlman, Yo-Yo Ma, Lang Lang, Emanuel Ax, and Peter Serkin. A versatile musician, George has performed with Tony Bennett and Dizzy Gillespie; his work in the recording studio with the rock group R.E.M. brought triple platinum recognition. He is scheduled to conduct the Chicago Symphony at the Ravinia Festival in the summer of 2019 in a concert featuring Jennifer Hudson. In 2015, Hanson capped a twenty-year relationship with the Tucson Symphony as Music Director, concluding his tenure with performances of Der Rosenkavalier and Gustav Mahler’s Symphony No. 3, as well as a special performance of Das Lied von der Erde. George’s highlights with TSO include performing Mozart piano concerti (conducting from the keyboard), releasing the orchestra’s first-ever CD recording to international acclaim, and receiving the Certificate of Congressional Special Recognition from Congresswoman Gabrielle Giffords for service to the community. George maintains a home in Tucson with his twin sons, Max and Victor. He recently formed a company, Hanson Creative Arts Management, drawing on years of experience in the symphonic and operatic worlds, and capitalizing on his business training at University of Arizona’s Eller College of Management. Among his clients is the Tucson Desert Song Festival, where he curated a celebration of Leonard Bernstein’s 100th birthday, raising funding and assembling one of the largest collaborative efforts ever attempted: 15 major organizations and 33 events over the course of 20 days in early 2018.